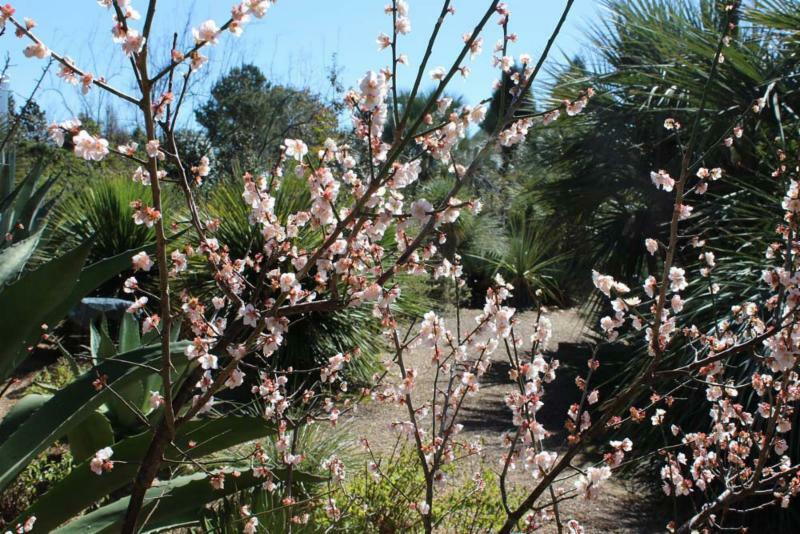 One of the stars among Peckerwood’s many winter-interest plants is Prunus mume, also known as the flowering apricot. 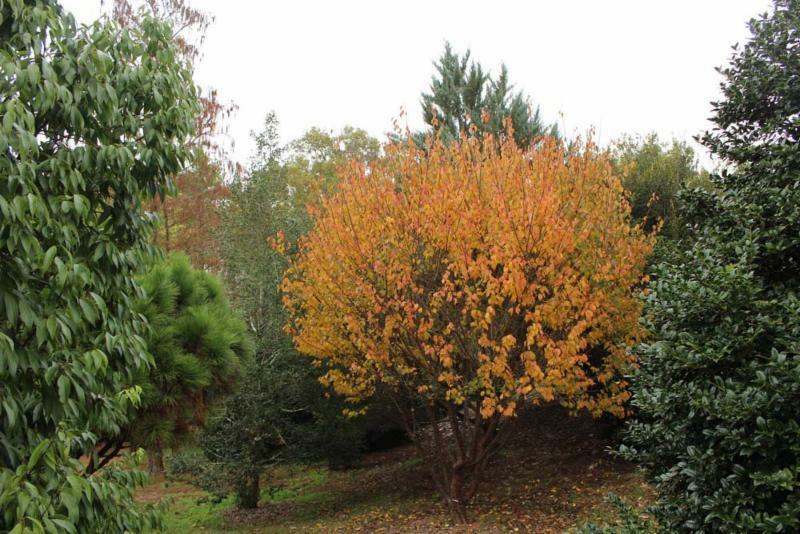 For quite some time, as evidenced by some large trees on the property, John Fairey has been amassing various cultivars for trial here in Texas. Though originally native to southern China, it has been popular as an ornamental cultivated throughout Asia for a few thousand years, especially in Japan, where many selections have been perpetuated. Flowers range from white to deep red, with all shades of pink in between from pale to deep rose. Beyond color selections, there are forms with double flowers, large flowers as well as those with weeping and contorted branches. Like many plums, apricots and cherries in the genus Prunus, these deciduous trees flower profusely in winter before they leaf out. 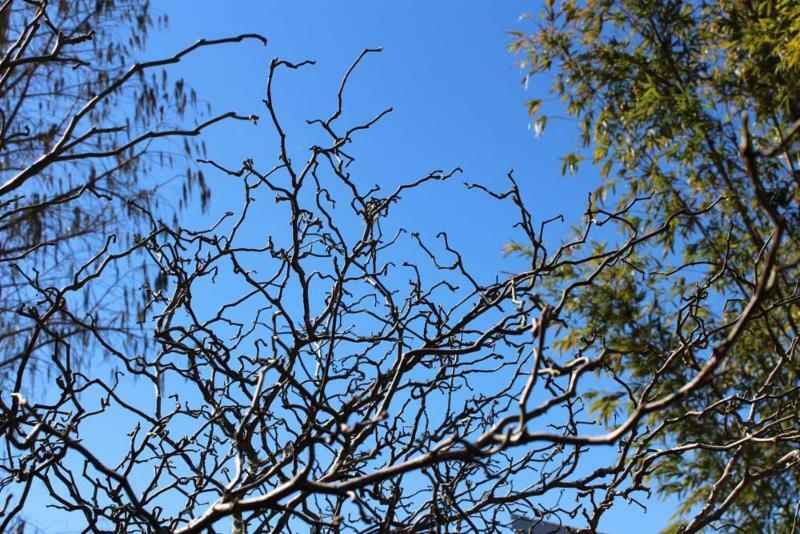 At Peckerwood, it seems that flowering time varies depending on the cultivar, and careful selection of specimens can result in a succession of flowering through winter and early spring. Though best known for their flowers, the trees also have wonderful bark and even produce reasonable fall color, especially striking with a backdrop of other evergreen plants. These ornamental selections produce inferior fruit to those intentionally selected or bred for palatability. 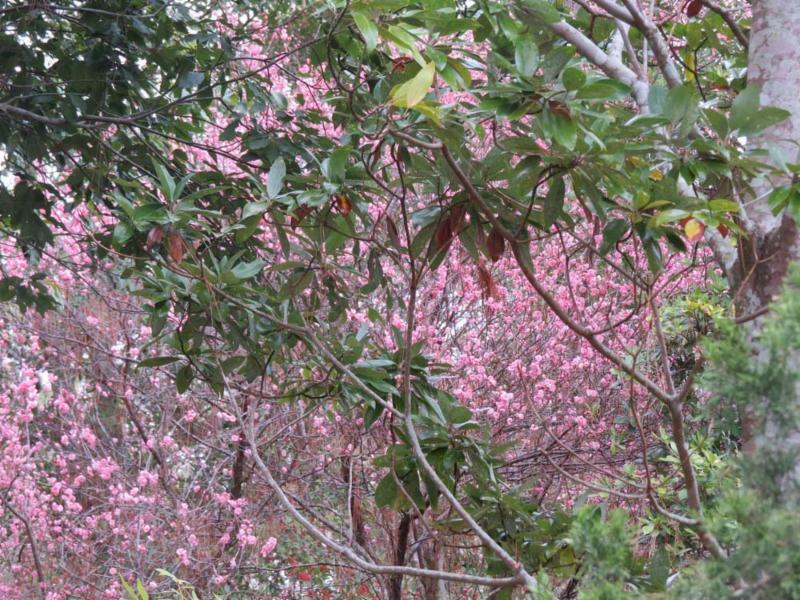 Camellia Forest Nursery in Chapel Hill, N.C. has been the primary source for these plants in the U.S. introducing many cultivars from Asia along with their own selections. Some nurseries graft the cultivars on other species of Prunus, some of which might not be as adaptable in our region, so it is best to investigate this with your source. Camellia Forest offers plants grown from rooted cuttings, which is the best option. The winter flowers of Prunus mume show up most strikingly when grown among evergreen neighbors. As we saw this past winter, one drawback in our gulf coast climate is that we don’t always receive the required amount of chilling this plant needs every winter. I’ve only witnessed the 2016 and 2017 flowering, and both years were quite floriferous. However, earlier this year, with our minimal cumulative chilling hours last winter, we saw erratic behavior when leafing out following flowering. Some cultivars leafed out fully, others sparsely, with some almost devoid of foliage all year. Though the trees are still alive, I doubt they will flower at all this winter, and it will be interesting to see if they have enough stored energy to leaf out this spring. It also will be of interest to see how those that did leaf out will flower this winter. This will be valuable data to continue to monitor in upcoming years in finding cultivars to recommend as reliable performers in our region. So how much chilling do flowering apricots need on average? First we have to note that there are different methods of measuring chill requirements over a particular region’s winter, including chill hours, chill units and chill portions, all of which take into account several variables. In a study “Evaluation of Chilling and Heat Requirements in Japanese Apricot with Three Models” by Zhihong Gao, Weibing Zhuang, et al., they determined that the “dynamic model” which is displayed as chill portions (calculated differently from chill hours) was the most accurate way of determining chill requirements for this species. Their research showed the optimum required units for flowering apricot ranging from 26.3 to 75.7 chill portions depending on the clone. As a frame of reference, the chill portions for us here in Hempstead the past three years were 53, 36 and most recently, 22. We are currently at 15 chill portions here in late December, so hopefully in the remaining winter months we can double that and be back on schedule.